This moment gave me pause. 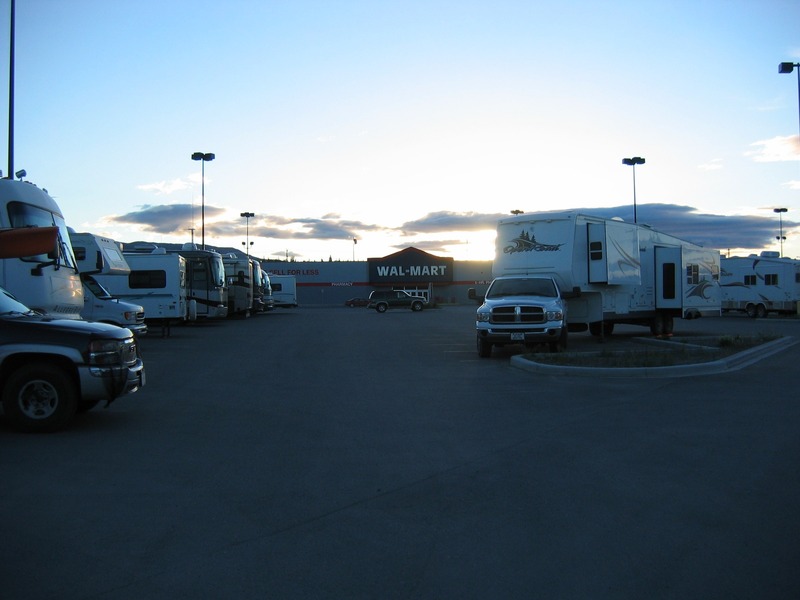 Every night of every summer, dozens of motor home travelers to Yukon take Wal-Mart up on their offer of free camping in their parking lots. Scanning the landscape of this parking lot, reading it as a cultural text, I asked myself if the travelers in this motor home, accompanied by dozens of others also “camped” here on this night, were answering the “the call of the wild.” And if so, does that mean that wilderness, like toilet paper, dish soap, cat litter, and frying pans, is available at Wal-Mart? This paper starts and ends with this moment in the Wal-Mart parking lot in Whitehorse, Yukon. From here, I reflect on the complicated, ironic, yet uncomfortably logical relationship between ideas of North, anticipations and imaginings of Yukon spaces as “pristine wilderness,” roads, windshields, and Wal-Mart. A complicated assemblage of politics, meanings, desires, histories, and power relations come together in this moment to make themselves visible. If “the call of the wild” can be answered at Wal-Mart, and wilderness, as a particular version of wild space, is available there, alongside the other items of the everyday, what does the view from here suggest about the relationship between Wal-Mart, wilderness, and windshields in the production of this place called North / Yukon? North has historically held a particular set of images in Canadian national-cultural imaginaries. From the “Great White North,” to the “True North Strong and Free,” to “strange things done by the midnight sun,” North in Canada has long been imagined, and activated, as a frontier-scape—a blank space upon which to inscribe national-cultural ambitions and desires. Politically, economically, and culturally mobilized with this image in tow, projects of nation-building have taken shape on the ground in northern regions of the country in keeping with the terms set out by “the frontier”—unpeopled, wild, resource rich, and free for the taking. Particular configurations of assertions of Canadian sovereignty, economic development, and nation-building become possible on this imaginative terrain called North / Frontier. Anna Tsing (2005) suggests that frontiers are not places or processes, but rather are imaginative projects capable of shaping places and processes. In this paper I explore how ideas of North, as they emerge out of the imaginative capacities of the frontier, come into view as a particular form of wilderness that is admired and appreciated in the Wal-Mart parking lot in Whitehorse. I am interested in the simultaneous processes of taming and wilding required for wild nature to be appreciated for its wildness and the role of roads, windshields, and Wal-Mart in this complex assemblage of cultural logics. Drawing from ethnographic research conducted in Whitehorse and Dawson City, Yukon, and many roadside pullouts in between, this paper examines how the frontier, as an imaginative cultural project, continues to shape how Yukon landscapes are perceived, anticipated, and experienced for visitor’s traveling through the territory admiring them as “pristine wilderness” through the windshield. Tsing, A. 2005. Friction: An Ethnography of Global Connection. Princeton: Princeton University Press.